Metal: Metal roofing tile is incredibly durable, and does not attract light despite rumors to the contrary. Price depends on the type of metal you choose. Types of metal tile include copper, tin, steel and aluminum. The latter is one of the cheaper options, while copper is quite expensive. However, the beauty of copper, especially when it 'catches the sun,' is unmatched in terms of metal roof tile. Slate: Slate is among the heavier types of roofing tile, but are stunning in appearance. You may need to reinforce your roof depending on what you're working with, something you and your contractor will have to discuss. Slate is frequently used on Italian, French and Colonial-style homes. Fiberglass: Celebrated for being both durable and lightweight, fiberglass tiles can last for decades if installed properly. They come in a variety of styles and colors. Cement: Cement tiles are available in a range of colors and are frequently found on Italian, Mediterranean and prairie-style homes. This tile is most often used in new home construction due to weight. 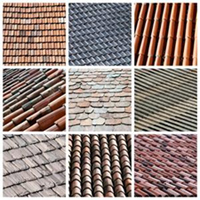 Synthetic: Another inexpensive option, synthetic roofing tiles frequently come with a 50-year warranty and are made with either rubber or polymers in combination with assorted fillers.